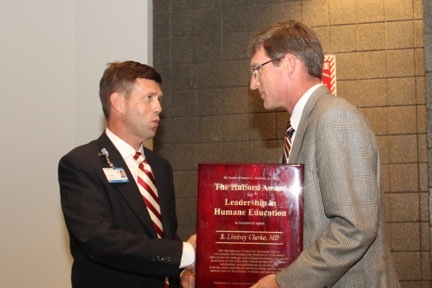 The South Carolina AHEC is pleased to announce that Lindsey Clarke, MD, is this year’s recipient of the Halford Award. Dr. Clarke is the Director of Resident Education and Associate Program Director at the Self Regional Family Medicine Residency Program in Greenwood. Dr. Clarke has been an integral part of the faculty for over ten years and has served as the family medicine department chair and directed medical student rotation electives. Dr. Clarke received the program’s Faculty Teacher of the Year Award in 2010 and was recognized as South Carolina AHEC’s Preceptor of the Year in 2015. The Halford Award is presented to a family medicine residency training program faculty member in recognition of outstanding leadership in providing humane education. The award is named for Dr. James Halford, who was the founding director of the AnMed Health Family Medicine Residency Program. Award winners demonstrate a caring attitude and respect for patients, residents and students; value human dignity; and demonstrate a passion and joy for teaching, learning and working with others. The South Carolina AHEC is pleased to announce that Kelly Jones, PharmD, BCPS, is this year’s recipient of the Sharm Steadman Excellence in Family Medicine Education Award. Dr. Jones has been a committed faculty member of the McLeod Family Medicine Residency Program for 27 years and embodies the consummate teacher. Dr. Jones has been recognized with the Teacher of the Year Award on numerous occasions and was named South Carolina AHEC’s Educator of the Year in 2016. Residents and faculty recognize his knowledge and skills, and he serves as counsel for graduates and health professionals from across the state. The Sharm Steadman Excellence in Family Medicine Education Award is given to a non-physician member of the faculty of a South Carolina family medicine residency program who has distinguished him/herself as an outstanding teacher and role model. The award is named for Sharm Steadman, PharmD, who was a professor with the USC Department of Family and Preventive Medicine, where she practiced for 25 years. Dr. Steadman received this award herself in 2012 as she represented exactly what this award was created to recognize: excellence in resident education, with demonstrated skills in teaching, curriculum development, mentoring, research, and leadership.